While human rights organisations and activists do operate in Kuwait, conditions are disimproving as the authorities use new laws and the court system - as well as alleged torture in detention - to silence critics and activists. On 25th November 2018, Kuwaiti authorities blocked a website where a book titled “I’m Bedoon” had been published. The book was written by human rights defender Khaled Al-Anezi. According to reports received GCHR, the website was completely blocked in Kuwait and unavailable online. Al-Anezi is a Kuwaiti citizen (without a citizenship certificate) and a writer from the Bedoon community who has been working for years to defend the rights of his fellow Bedoon citizens in Kuwait. He received a number of threats since publishing the book on 21st November 2018. The Bedoon community are a stateless Arab minority in Kuwait. On 5th October 2018, the twitter account of human rights lawyer Abeer Al-Haddad was reportedly hacked in Kuwait, four days after she sued the head of the Central Apparatus for Illegal Residents’ Affairs. Haddad’s twitter account was temporarily restricted following the filing of the legal complaint. On 2nd October 2018, Al-Haddad had filed a legal complaint at the Administrative Court against the head of the Central Apparatus for Illegal Residents’ Affairs, Saleh Al-Fadala, for his failure to reform the situation of the Bedoon community in Kuwait and protect their civil and human rights. Article 43 of the Kuwaiti Constitution guarantees the right to establish associations and trade unions. This right is severely constrained in practice by government’s use of legislation to suppress independent assessments of its human rights record. Article 43 of the Kuwaiti Constitution guarantees the right to establish associations and trade unions. This right is severely constrained in practice by government’s use of legislation to suppress independent assessments of its human rights record. Law 24 of 1962 is the primary legal instrument regulating the operations of civil society and it gives government excessive power to limit the work of CSOs. Under this law, all CSOs must register with the Ministry of Social Affairs and Labour. But selective politics is used to deny registration to CSOs that are too critical of the state. CSOs can also be denied registration if the state deems they are not set up to provide a “public service” or that proposed activities are already being carried out by other CSOs. Organisations are also prohibited from taking part in political activities and have to seek approval to participate in foreign events and conferences. Two of Kuwait’s leading human rights groups, the Kuwaiti Bedoun Gathering and the Kuwaiti Bedoun Committee, are regularly subjected to unwarranted harassment and intimidation and in 2012 faced various charges including being accused of “forming a secret organisation”. Torture and other degrading treatment is used against human rights defenders while in detention. The courts also strip activists of citizenship as punishment and bar activists from undertaking international travel. The right to assembly “without permission or prior notification” is explicitly granted under Article 44 of Kuwait’s Constitution. The right to assembly “without permission or prior notification” is explicitly granted under Article 44 of Kuwait’s Constitution. However, other laws are used to undermine this right. Security officials including the police harass peaceful demonstrators who also face judicial persecution. Some popular charges used against protestors and organisers include “destabilising the safety and security of the country”, “incitement to protest”, “causing damage to public property”, and “attacking police”. The 1979 Public Gatherings Act has also been controversially used to ban public assemblies of more than 20 persons per gathering. When this has been ignored, the police use excessive forces, tear gas and sound bombs to disperse protestors. 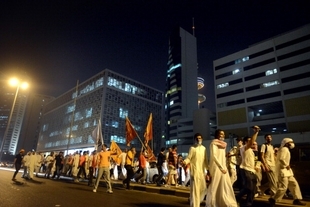 On 20th October 2012, the Interior Ministry issued a proclamation to the effect that it would “absolutely not allow any protests rallies, marches, meetings, and sit-ins regardless of the reasons and motives.” The state also abuses the penal code to punish activists, by using the provision which allows the police to detain a suspect without charge or access to legal counsel or family for up to four days. In 2015 police violently dispersed about 800 demonstrators protesting state abuses and detained more than a dozen, threatening them with criminal charges. In 2016, the Bedoun minority rights leader Abdulhakim al-Fadhli was arrested and later expelled from Kuwait on allegations of taking part in an “illegal gathering”. Although Article 36 of Constitution provides for the right to hold opinions and exercise free expression, other provisions of the Constitution and other broad and vague laws such as the Printing and Publication Law, Misuse of Telephone Communications and Bugging Devices Law are used to silence dissent and journalists. Although Article 36 of Constitution provides for the right to hold opinions and exercise free expression, other provisions of the Constitution and other broad and vague laws such as the Printing and Publication Law, Misuse of Telephone Communications and Bugging Devices Law are used to silence dissent and journalists. The state owns much of the broadcast media although there is some private ownership too. Although Kuwaiti journalists are considered among those with better freedom in the region, vague laws allow for the Ministry of Commerce and Industry to ban any media outlet at the request of the Ministry of Information and journalists are careful not to cross the line by criticising the Emir who is protected under section 54 of the Constitution. A journalist was arrested in 2015 for criticising the judiciary after he questioned a judgement on social media in which activists were sentenced in absentia. The Press and Publications Law, revised in 2006, criminalises the publication of information deemed offensive to God or Islam, criticism of the Emir, calling for the overthrow of the regime, and the release of secret material. In September 2012, the Ministry of Information closed pro-opposition television station, El-Nahg, 24 hours after its launch. Two months later, the government also shut down al-Youm, a private television station, for “failing to meet administrative conditions”. The newspaper, Al-Dar, has been routinely suspended for "undermining national unity". The same newspaper’s editor-in-chief Abdul Hussein al-Sultan, was sentenced to a six-month prison term for publishing articles to incite violence. A member of the national committee which records violations against free expression was slapped with an international ban. A new law came into effect in January 2016 to regulate online newspapers and platforms and the state bars some websites for “moral reasons”. Ordinary citizens are also often charged for posting on social media including Twitter and Facebook under the new law and the broad 1970 penal code for tarnishing the royal family.